...Kwabena Agyapong, Francis Poku, General Hamidu, Major Sulemana, Asamoah-Boateng & Akuffo-Addo... Accra, Nov. 12, Chronicle -- THE MINORITY Leader of Parliament, Mr. Alban S.K Bagbin, has said that the seeming acrimony and tension in the country is largely due to President Kufuor's appointment of anti-Rawlings extremists who see their position as an opportunity to revenge. “The tension in the country is due to the appointment of embittered people to key positions, who had problems with Rawlings and his regime,” he said. Speaking to The Chronicle in an interview, Mr. Bagbin mentioned personalities like, Mr. Kwabena Agyapong, press secretary to the president, whose father was abducted and murdered during the Rawlings-led regime. The next person he noted was, Mr. Francis Poku, the National Security Coordinator, who allegedly suffered at the hands of Captain Rtd. Kojo Tsikata, the former security capo, and went into self-imposed exile, while General Hamidu and Major Sulemana who resisted a coup attempt were almost captured and executed. In the case of Mr. Stephen Asamoah Boateng, the Deputy Minister of Information, the minority leader stated that, he had felt disillusioned about the Rawlings-led administration and eventually fled into exile. Touching on the reasons why Nana Akuffo Addo, Minister of Foreign Affairs, may take the advantage of the government and his position to pay Mr. Rawlings back, he said, his father's Ringway Hotel in Accra was seized, and he was invited by the police to the Police Headquarters for interrogation, which did not go down well with him. According to the NDC MP for the Nadowli North Constituency, it was an orchestrated attempt by the government, saying that there was no need for the NDC to stage any coup in the country. “What is the need of staging a coup to destabilize the nation when we know clearly that we have already won the election?” He asked. It would be recalled that just a few minutes before the NDC launched its regional campaign; the police issued a statement, indicating that they had arrested seven people involved in a conspiracy to stage a coup. According to sections of the reports, the arrested persons were retired military men who had been members of the defunct 64 Reserve Battalion. 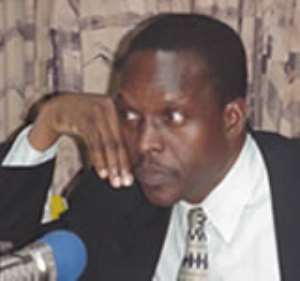 But Mr. Bagbin who did not rule out the fact that, the Criminal Investigations Department could investigate the circumstances that surrounded the attempted coup, was of the view that since a coup could only be carried out by the military, it was strange that it was the police who were conducting the investigations, instead of the Military Intelligence (MI). He noted that it was the MI that dealt with military issues and had the offenders court-martialed.